You are currently browsing the tag archive for the ‘Aspen Cuffs’ tag. I am officially resuming my Talkin’ Tools segment. For this one, I would like to share my experiences with Chasing Hammers. There are A LOT of chasing hammer manufacturers and I certainly cannot give a comprehensive assessment, however, I can provide my insights and opinions on the ones I have and use. Last summer, I had what I considered to be a once in a lifetime opportunity to learn Chasing and Repousse from Il Maestro Fabrizio Acquafresca. It was a great experience and ignited a passion within me for this technique. 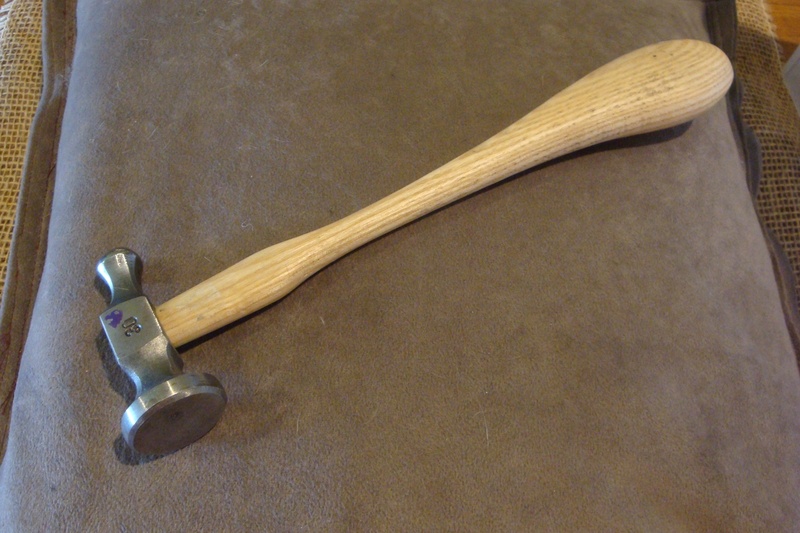 I’m pretty sure the chasing hammer Fabrizio was using was one that had been handed down for generations. It had that wonderful aged look from use and care. This is the hammer that came in our kits. Nice weight and it has rounded face. I have discovered that I actually prefer a flat face because it gives me better striking surface. 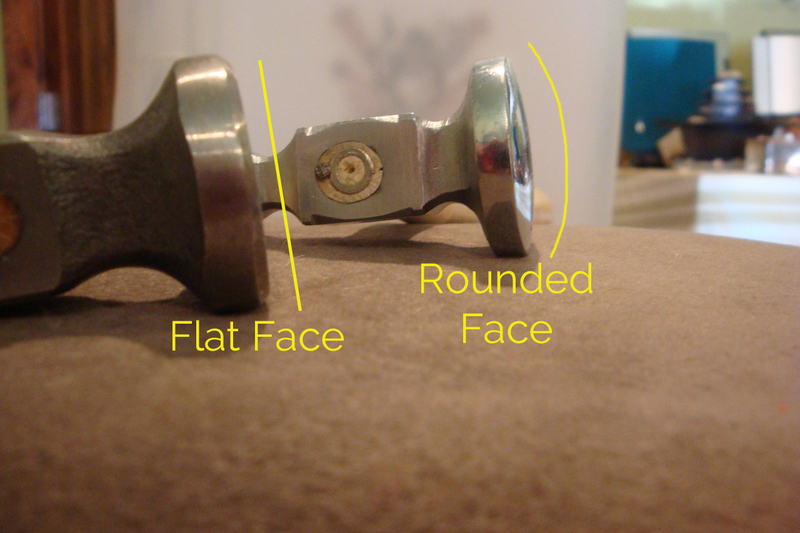 This picture shows the differences between a flat face and rounded. It certainly is not a high end, quality chasing hammer, but it does the job and is great for getting a feel for the technique of chasing and repousse. 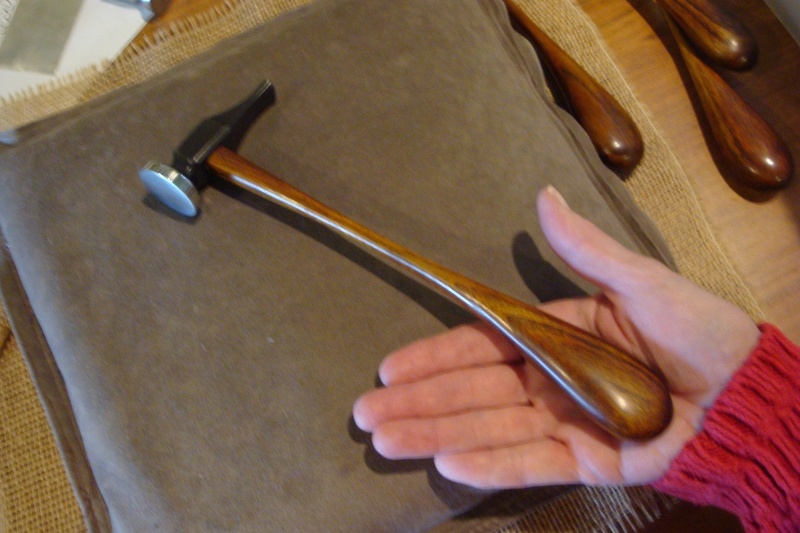 One thing that happened during the 5 day workshop with Fabrizio is the head of this hammer became loose with use. Fabrizio fixed it with the well placed insertion of a nail as shown in the photo below. Now I will never give this hammer up for many reasons, but it is no longer my hammer of choice when doing Chasing and Repousse. 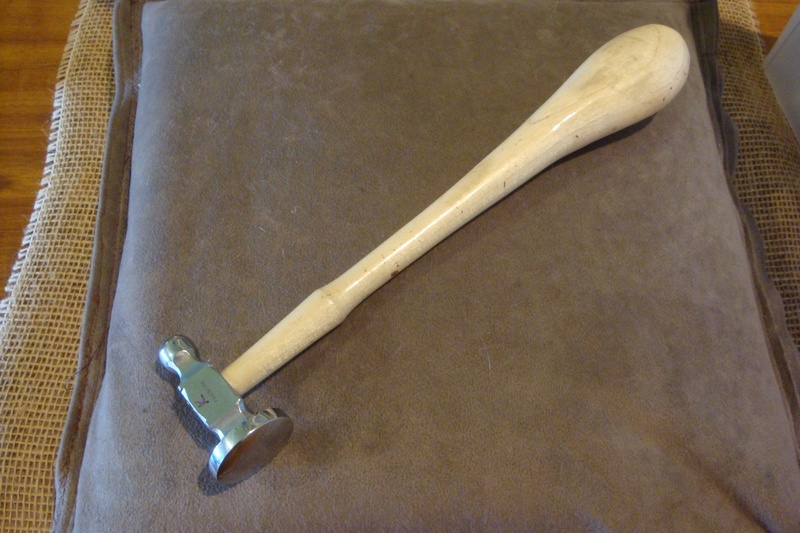 I have a variety of econmonical chasing hammers ranging from $15 – $30 is cost per hammer; I also have some high end, quality chasing hammers that I will discuss toward the end of this post.. The reason I have a number of the less expensive hammers is because they are a good all around hammer for working with stamps, punches, dapping blocks and forging metal, like creating the frames for my Treescape pieces. 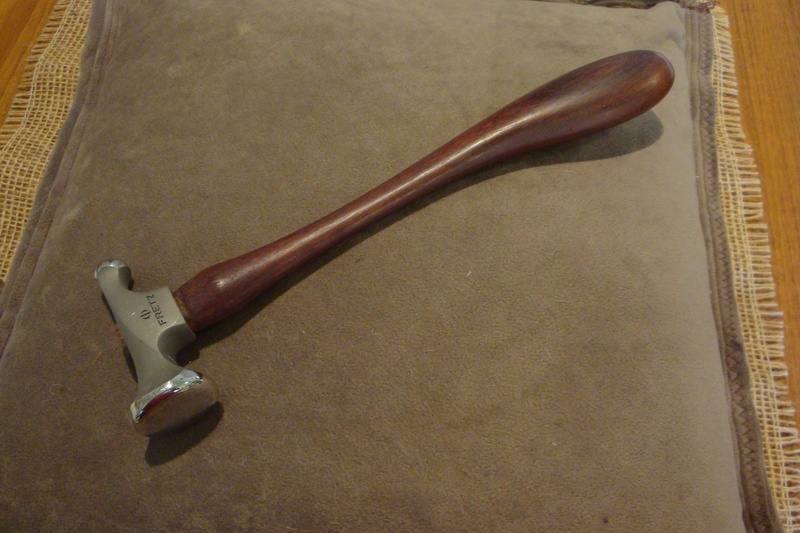 This is the first chasing hammer I purchased when I began metalsmithing. It came from Allcraft and is a solid hammer with many years of service in its future. It was roughly $30 about 8 years ago. The handle needs a bit of smoothing and a tip from the workshop was you can use the edge of a piece of glass to gently smooth the handle. 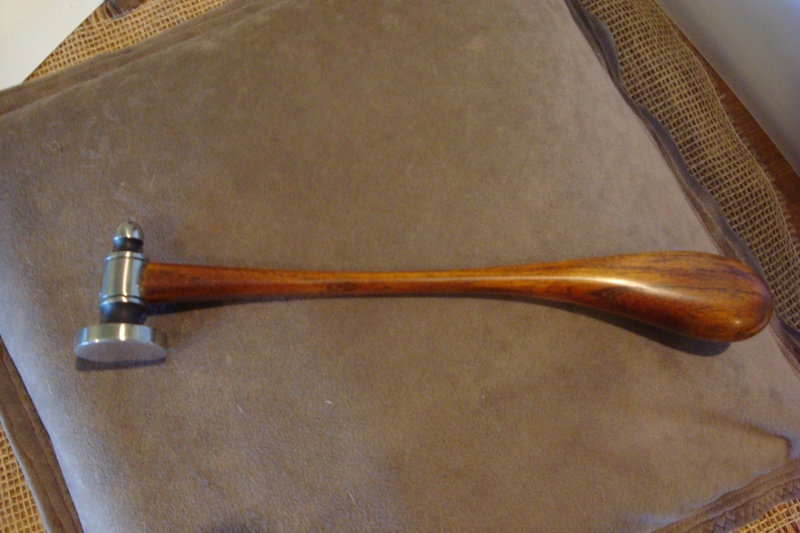 Pictured below is another chasing hammer I purchased through Thunderbird Supply during one of their overstock sales. It is heavy and very solid. 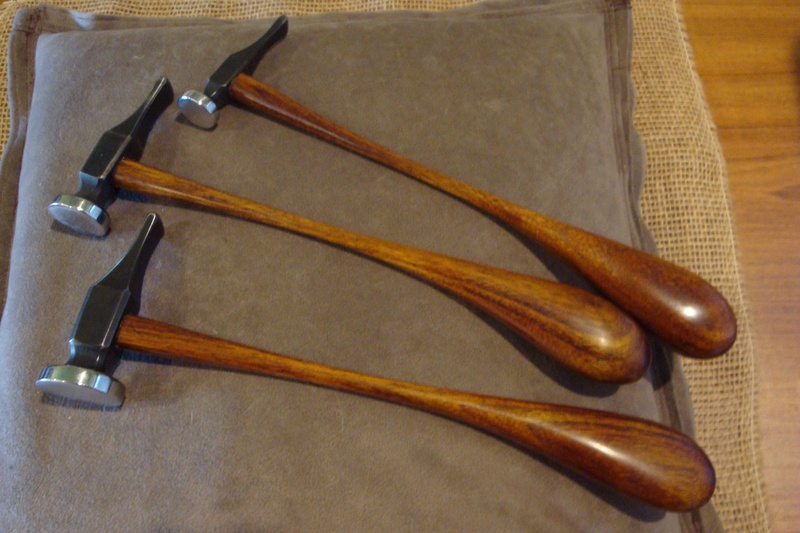 One thing you will find with the less expensive chasing hammers is the quality of wood used isn’t as nice, they are not as well balanced for hammering and the handle shapes are not as well defined. You’ve probably noticed that all these pictured have a bulbous end. That is designed for comfort and to help with how you grip the handle. It reminds me of instructions I received when playing tennis; grip the handle like you are going to shake hands with it. Not too tight, a nice gentle and relaxed grasp. Place the ‘bulb’ end in the palm of your hand. Wrap your fingers around the bulbous handle with a gentle grip. Drum roll please. My indulgence in a great, quality chasing hammer came with my purchase of this one from Saign Charlestein, owner of SC Studios LLC. It has 4 ounce head. Perfectly balanced. Higher quality Osage orange wood for the handle. Superb craftsmanship. You may think it is too beautiful to use, but that definitely isn’t the case. 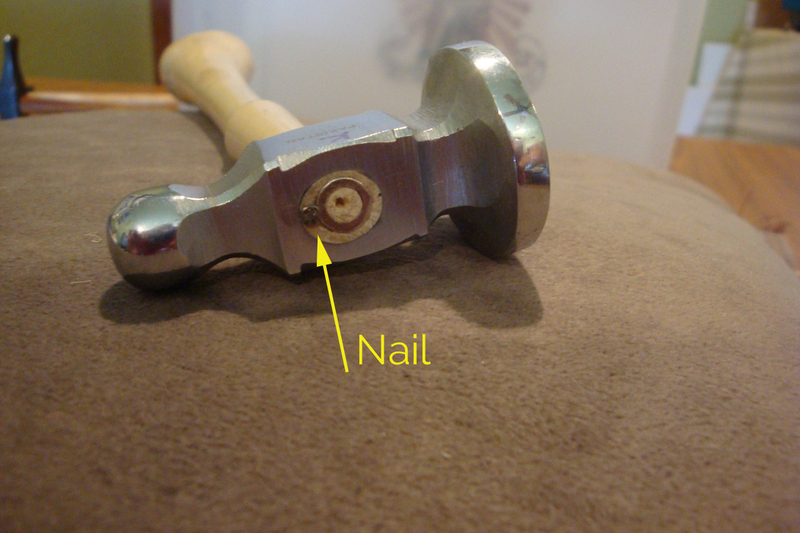 You can find a variety of Saign’s hammers, chasing tools and tutorials on his website, Metalsmithing-Tools.com. 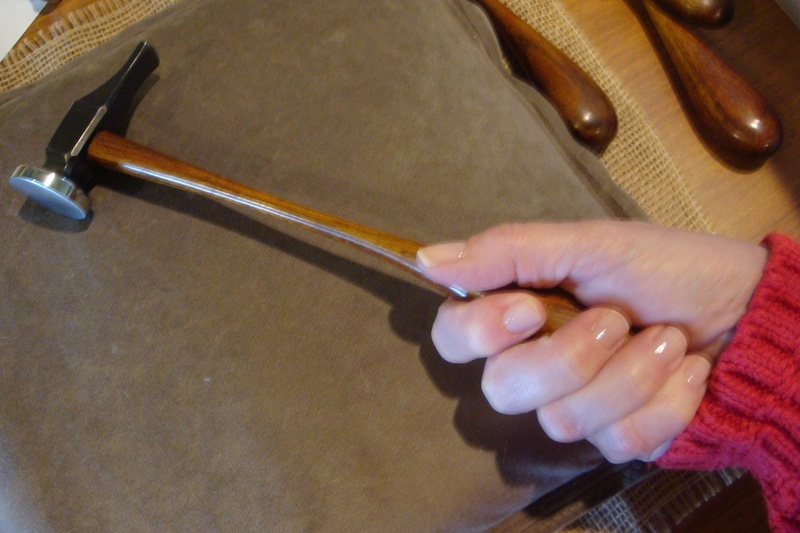 The design of the handle and the wood Saign uses is such that it allows for the correct movement/action when hammering. This helps to prevent injuries that can occur with repetitive use of the hammers in metalwork. Trust me, you want the hammer to do the work, not your body. Correct grip, use your wrist. This hammering technique is one best learned in a workshop or by watching videos put together by people like Saign or Fabrizio. As with any tool, proper grip and technique are imperative for achieving the desired result. At the end of the workshop with Fabrizio, he told me to keep hammering. Practice is the key to success with anything. I try to hammer every day, but that is not always possible with my schedule. I will say that when you have a quality hammer, like the ones Saign produces, they do help you to develop the correct hammering action. Remember posture is just as important. Don’t hold the handle with a death grip as that will not only fatigue your hand and arm, but will result in your body absorbing some of the ‘shock waves’ from the hammer blows. Gently grasp the hammer in your hand. Move your wrist in action with the hammer usage. It should be a nice flowing action. For chasing, your work surface should be at chest level which requires the proper chair height and work table. I am more comfortable when I sit more upright and do not hunch over my pitch while chasing. 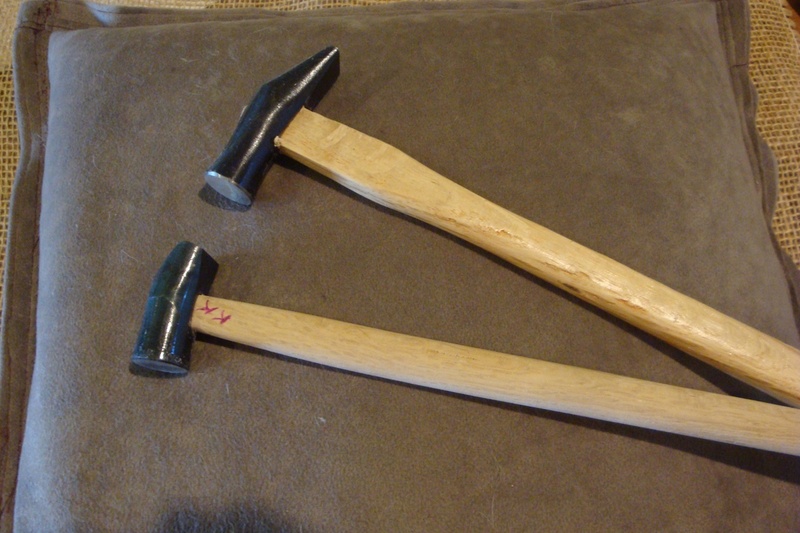 This Christmas, I treated myself to the purchase of a set of Saign’s hammers. I wanted the different weights so I could select the right hammer for working with my designs. The lightest head here is 2 ounces for detail and texture work up to 3.5 and 4.5 ounces to get the job done. These have become my work horses for the designs I create. Now you may wonder what size is right for you. It just so happens that Saign posted a video discussing Chasing Hammer Sizing on this past Tuesday. Please take a look as he does a great job answering the question. 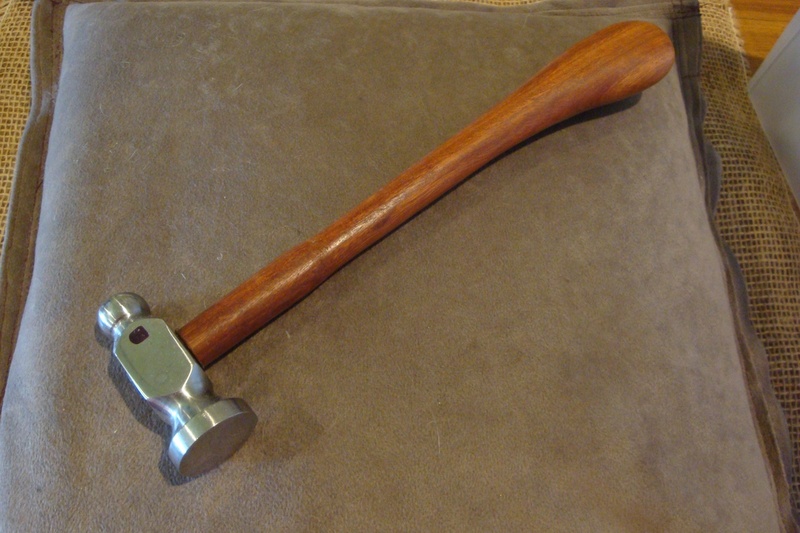 Could I find comparable hammers for less money, no doubt. Would I be as happy with them, I really don’t think I would. In this case, my opinion is you get what you pay for. I have a number of Fretz hammers. They are truly beautiful. I love the Fretz texture hammers I have. However, the head on my Fretz chasing hammer is loose. In part, because I live in Colorado where it is very dry and the wood shrinks. I’ve heard of a number of solutions, but I’m not comfortable trying any of them, so the Fretz hangs on my peg board above my bench. I can tell you that it does not have the weight or balance the Saign’s hammers do. 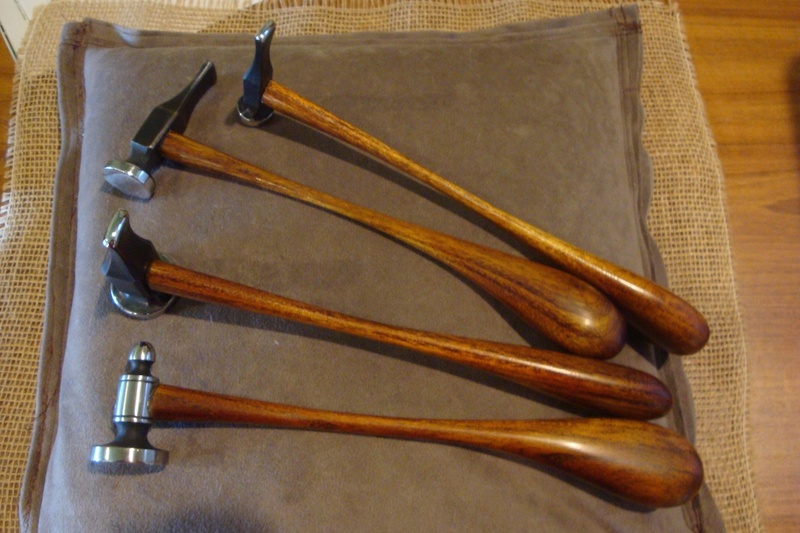 I also have a wonderful selection of N C Black Hammers and I am extremely happy with them; however, to my knowledge they do not make a chasing hammer. If they did, I’m certain I would be very happy with the quality of theirs based on my experience with the others I have. These are Japanese chasing hammers. They look quite different from the others mentioned so far. They are small in design to fit with the smaller, lighter Japanese chasing tools and chisels. I do enjoy using these. Their hammering action is quite different from the others, but I find them great for applying textures. They also have flat hammer faces. Ideally, if you can ‘test drive’ a hammer before purchasing it, that’s the best route to go. Everyone’s hands are different and some may fit you better than others. I’ve been pretty fortunate with the selections I have made. Ronda Coryell’s DVD with Fabrizio on Chasing and Repousse. Nancy Megan Corwin’s book, Chasing and Repousse. When you have the right hammer and practice practice practice….the joy of moving metal into beautiful shapes is absolutely magical. 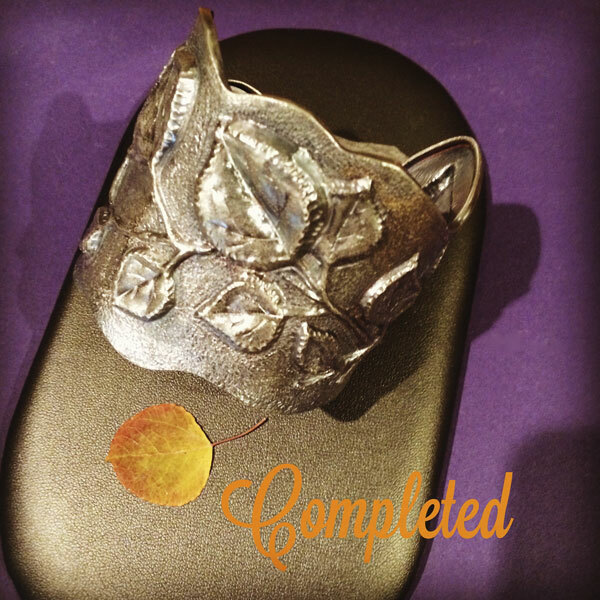 This is one of my latest Aspen cuffs. I think the reason I enjoy these so much is the Aspens in our back yard have served as my models. I hope you have enjoyed the return to Talkin’ Tools.